Do you always forget your trash bags when painting? I'm always having to borrow one from my fellow painters. I like to create ways to travel lighter and more efficiently, so I came up with this way to make sure I always have my trash bags with me. And they won't be floating around loose in my bag, getting in the way. I hook mine under the clip on my tripod, but you could poke a hole and and it on a screw or an S hook. Check out my Facebook page Claudia Williams Studio and my Pinterest boards for more ideas. I just went on my annual girl trip vacation. The only painter. I really wanted to be able to paint, but not take a lot of bulky equipment. I narrowed down my tube colors, my Rosemary & Co. brushes, one medium cup, a roll of tape, no problem. And I always paint on linen sheets, so they take up no room. How to transport my wet paintings? I'm sure this is nothing new to a lot of you, but it was new to me, and I'm quite pleased with the results. I usually paint 9x12 on the road, so I cut foamcore into 11x14 rectangles with my handy Exacto. I got some square balsawood-ish rods at a craft store for almost nothing, and cut them into about 6 inch pieces (with my handy Exacto). 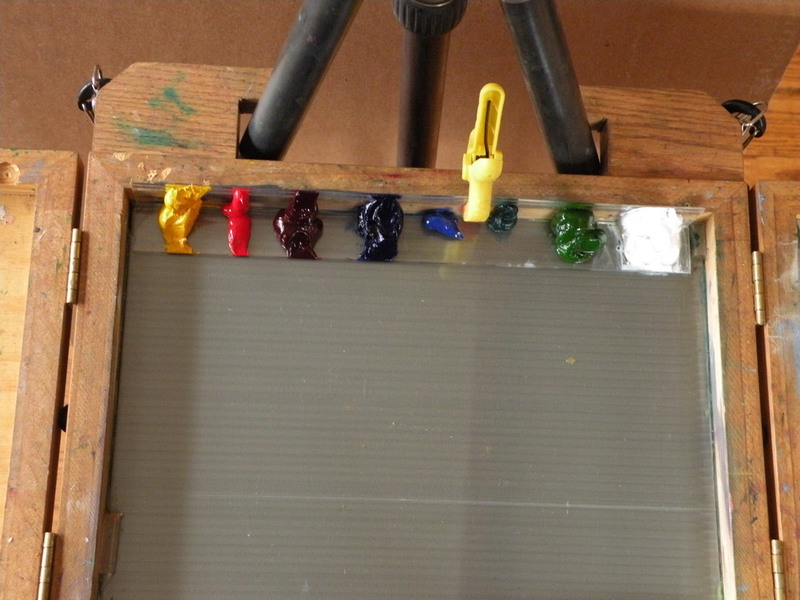 I Elmer's-glued one each onto the edges of my foamcore rectangle, creating the space needed for the wet paint. Then I taped my 9x12 gessoed linen sheets onto the board. Voila. 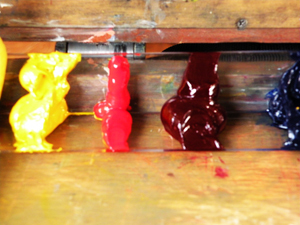 Stackable, portable, wet paint carriers. Good to go. BTW, you could also stick a painting panel on the board just as easily, using double sided tape.) 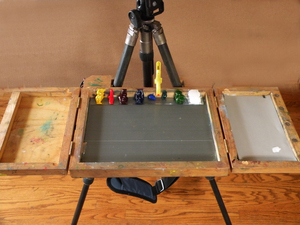 And, as long as your foamcore boards are the same size, you can attach any smaller size painting surface to the board. See the little sticks glued on the boards? Click to enlarge. I then just stuck the whole bunch of them into a zip plastic carrier bag, and they didn't move around. And so what if they do move a little? The wood strips protect the paintings from getting smeared. Of course you could secure the boards any way you wanted to, Velcro strips, big rubber bands, string, but this worked just fine, the bag kept them in place. For larger stacks, get a bigger bag or make several smaller stacks. A smaller stack for a day out. Still not light enough, I say. I decided to ditch the Pochade box with its bulk and weight. And I always worry about the glass breaking. An artist friend, Dawn Whitelaw had told me a while back about using Contac paper (clear, sticky, yes, like you use on shelves) instead of glass in her pochade box. It is an easy cleanup and if you don’t feel like cleaning it completely, just peel it off. I decided to take it one step further. I took another 11x14 piece of foamcore, covered it in clear Contac paper, smoothing it out flat easily, flipped over the board and trimmed the excess with my Exacto. Oh, eureka! 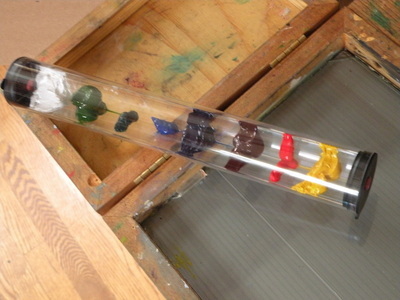 The most lightweight paint palette ever! I just tossed that on top of my other boards as the “Top”. All the same size. All lightweight. A dream come true. I might add that the Contac paper cleans up just like glass. It's amazing stuff. So I've got everything in this bag that I need. One medium cup, artist tape, brushes, paints, medium (in a leakproof prescription medicine bottle, small) and my boards. Heck, it all fit in my tote bag. And I still had room for my Ipad, Nook, purse, and other essentials. Now, you might notice there's no easel. I will come up with something. But for this trip I was so happy to be a feather-weight painter that I didn't mind putting the 11x14 board in my lap or on a table for painting. Thinking ahead, knowing I might use a table, I brought more Contac paper to put on the table for messes and laying down the brushes. Guess what? It didn't weigh a thing! I kind of like how painting on the ground gave me some distance from the painting. I welcome your comments on what you think of Rosemary & Co. brushes. Send me your thoughts…. I am proud to be a new U.S. Representative of Rosemary & Co. Artist Brushes. 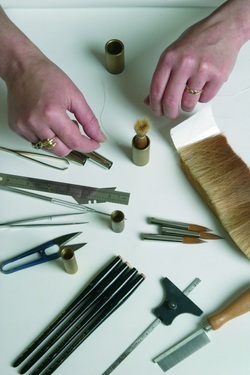 These brushes have been hand-made by a small family company in Yorkshire, UK. for over thirty years. While I was ordering brushes from their shop in England one day, I thought, “Why don’t I ask them if I could be a distributor for them?” My timing was just right, and here I am. 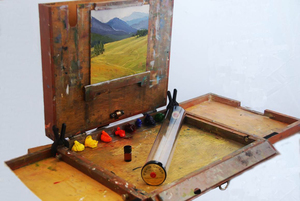 These brushes are wildly popular with artists—studio and plein air. They feel so right in your hand and they seem to last longer than other brushes. And the price is definitely right. Look around on the internet for Rosemary brush reviews, you’ll see people singing the praises of this company’s brushes. Among others, Richard Schmid recommends them. Rosemary Jackson, the owner, has developed some lines of brushes by sitting down and “thrashing out” ideas with these artists. For example, the artist Dave Shevlino wanted a brush that was a cross between a filbert and a flat. Voila! See the Ivory Flat Curved Edge brushes. Because they are a small company, truly interested in bringing the finest brushes they can bring to the artist, they can do this. Their business is not just “business”, but a creative, ongoing improvement of quality brushes with the artist in mind. Everyone at the company is so friendly and willing to help artists. Never hesitate to contact them, And they have a sense of humor (humour…) at Christmas they dyed some of the Ivories green and called them the Evergreen line. Rosemary has the entire large line of brushes, I carry Ivories, Classic (90% bristle 10% synthetic), and Masters Choice lines. I’ll continue other blog entries that will tell more about these wonderful brushes. See you soon! ﻿Peggi Kroll Roberts developed thes﻿e most wonderful MVP's. MVP stands for Mirror, Value, and Planner. A lanyard holding all three items hangs around your neck, so you won't lose them and they're always at hand. 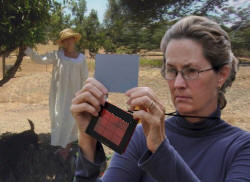 The plexi-glass Mirror enables artists to look at their painting and/or subject in reverse making inaccuracies easier to see. 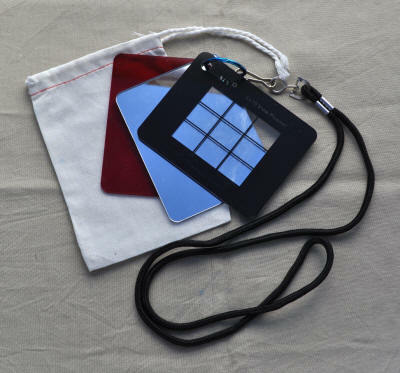 The Value Viewer is a piece of transparent dark red plexi- glass enabling the artist to see only shades of lights and darks for determining the appropriate value relationship to be painted. The Planner, is a clear piece of plexi-glass with a 1/2” black border surrounding a black lined grid enabling the viewer to determine desired composition and accuracy in drawing of the subject. All 3 plexi-glass viewers are 3”x4”x 1/8” with a 1/4” hole drilled in a corner suspended on a 1-1/4” key ring and attached to a lanyard. I had one and found it invaluable, —unfortunately it is in a cow field somewhere... I'm very glad to have another one for the coming spring painting. I also use it in my studio. http://artworkessentials.comThe Planner is actually from Artwork Essentials , but Peggi came up with the idea of putting all three together in a handy unit. Hooray, Peggi. Peggi demonstrates her new product in this video. 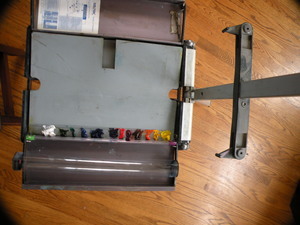 This helpful artist tool can be found by visiting krollroberts.com OR on this website here! Click on Art Related Items on Home page. 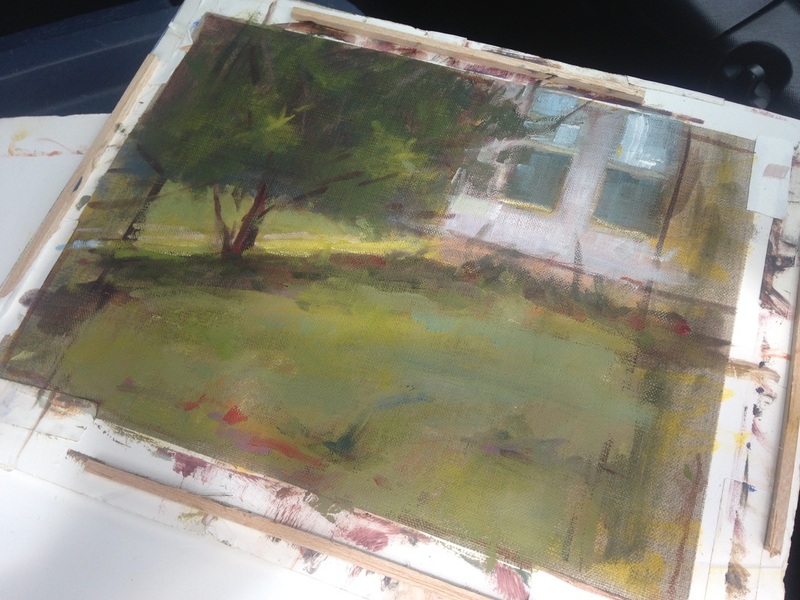 Plein Air and Studio Tips and Equipment to make your painting experience even better. Okay, I admit I haven't tried this yet, but I can't wait. An artist friend of mine showed it to me yesterday, and she is crazy about it. How can it not be wonderful? It can save your wet paint for weeks. Right there, I'm sold. 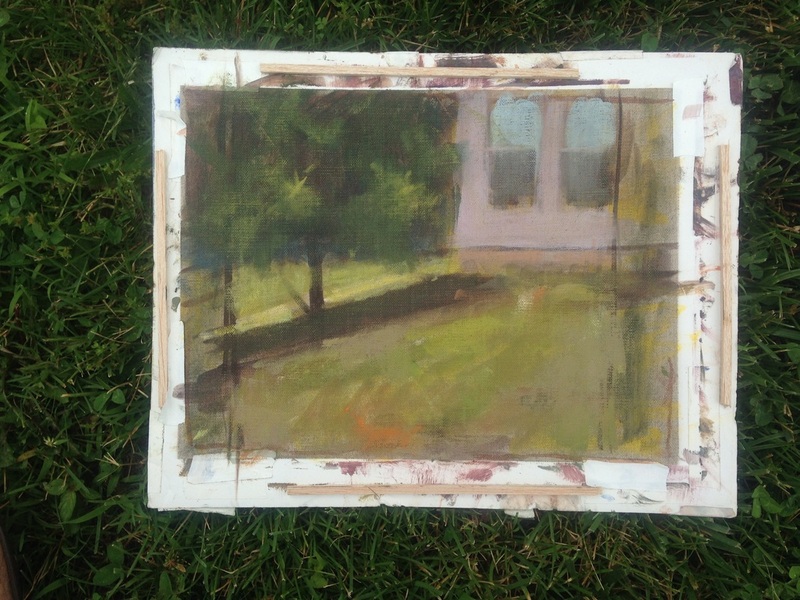 And you can use it all kinds of ways to make plein air painting easier. This unassuming tube has seemingly magical properties. Yes, it can keep you paint from oxidizing for several weeks. At room temperature. The magic is in the air tight, lightweight tube and the clove oil that is contained in the end caps. 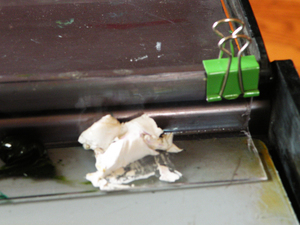 No need to put clove oil on your paints, no mess. 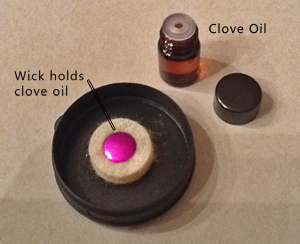 A small bottle of clove oil is included with the Palette Garage. 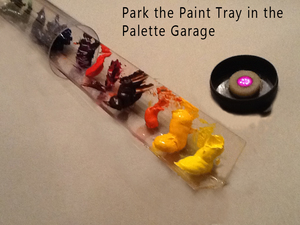 The Palette Garage comes in different sizes to fit your pochade box. The instructions say to keep it horizontal, but I've been told by a reliable source that you can stick it in your backpack any old way. Find it at: www.palettegarage.com. Go to their website to find out more about it. When finished, store the paint strip with your left-over paint in the "garage"
Non-chemically reactive material allows for easy removal of old paint..
Claudia Williams is a plein air and studio artist who is always on the look out for a better way to manage the art of traveling with paints. She hopes you find that this blog will help you in packing light and painting easier in the great outdoors.